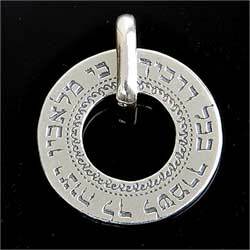 925 Sterling silver kabbalah necklace with the verse: "For he shall give his angels charge over thee, to keep thee in all thy ways". (Psalms, XCI,11). This beautiful and unique necklace was designed with the inspiration of the Jewish mystical studies - the kabbalah and is believed by the ancient traditions to protect the wearer and give upon him, good luck and success. A true and unique gift that will be cherished by your loved one for ever more.